In this roundup: (1) Indonesia blocks YouTube over “Fitna” the movie. (2) Saudi Arabia: Fouad Alfarhan's blog and Freefouad blocked. (3) Slide blocked in Turkey. (4) Yemen blocks Maktoob blogging platform. The Indonesian government has ordered the country’s internet service providers to block YouTube for publishing the 15-minute anti-Muslim film “Fitna”, made by Dutch MP Geert Wilders, leader of the anti-immigration Freedom Party (PVV). Some of the country's ISPs followed the block order, but “Fitna” could still be viewed through other providers. “A letter was sent to Internet providers asking them to block any site or blog posting the film Fitna (…) Not only YouTube has uploaded the film, so it is up to the ISPs’ discretion to block these sites,” a Communications and Information Ministry Official is quoted as saying. Earlier this week, Indonesia had threatened to block YouTube unless the video-sharing web site removed the aforementioned movie. The blog of the detained Saudi blogger Fouad Alfarhan was blocked today in Saudi Arabia, along with the Free Fouad website, which is dedicated to Alfarhan's case, and the pro-reformist blog Freedoms. 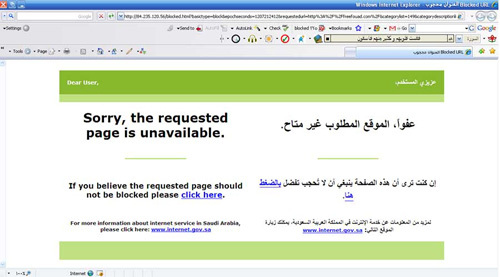 Users trying to access these blogs from Saudi Arabia were met with a notice saying “Blocked URL. Dear User, Sorry, the requested page is unavailable. If you believe the requested page should not be blocked please click here. For more information about internet service in Saudi Arabia, please click here: www.internet.gov.sa“. If you use Slide in Turkey, you've probably noticed that you are no longer able to access the Slide website or our applications (you may not even be able to access this post). The Turkish government has accused Slide of “harboring pictures and articles that are considered to be insulting to Ataturk,” founder of the republic. We have contacted the government of Turkey in an effort to resolve this situation and will keep you updated on any changes. In the meantime, we're trying our best to enable Turkish citizens to access our website and applications again. According to Slide statistics, Slide widgets are being viewed by more than 143 million unique viewers every month in more than 200 countries on websites like Facebook, MySpace, Hi5, Orkut, and Blogger. Maktoobblog.com, one of the most popular Arab blogging platform, was recently blocked in Yemen, cutting off Yemeni Internet users from the more than 46,960 blogs the service hosts. According to MaktoobBlog, there are currently 1,226 Yemeni blogs hosted by the service. All of them disappeared from the Yemeni Internet. ONI technical investigation verified that the service has been blocked by Yemennet, Yemen’s government-run ISP. Access is blocked to the entire domain maktoobblog.com, effectively to every blog hosted by the service. Interestingly, users who attempt to access the site receive a network error message instead of the standard blockpage, which is served when users attempt to access sexual content. This significant blocking is expected to hinder Internet users in Yemen from blogging and reading blogs because maktoobblog.com is home of one of the largest blogging communities in the Middle East and North Africa. Another issue that deserves attention in Yemen is the blocking of YemenPortal.net. In fact, I feel quite enthusiastic of the detaining campaign conducted by the Saudi-Arabian government on bloggers. That means that the intellectual people (bloggers) are harassing the dictating regime which has been long disguising itself under the mantel of Islam. The question, I have been asking myself is that what Islam they have been enforcing on people? Is this Islam to seize other’s way of thinking? Is this Islam to deprive people of expressing viewpoints? Is this Islam to take state decisions without consulting the mass of people? Is this Islam to capture people only that they say their opinions frankly? Is this Islam to ban other’s ideology even if it is different from you? Finally, I could come up with satisfactory answer that is our Arabic presidents are our curse. And this is not an outcome of only few years or even decades but it is a result of many centuries in which the Islam was used as a tool to maintain iron grip on the mass of people. Our Islam was quite manipulated in such a way that it controls people’s minds. That has resulted in changing our set of mind to be only sheep that listen and obey, that go wherever the leader goes. Then, I would be more than honoured to be any one else other than that incapable Muslim. We have wonderful religion but it should be re-contextualised from new and be far from any political interests. All my prayers to you, AlFarahan. God bless you. I’m surprised that you don’t even mention China. China has been covered by our Chinese language editor John kennedy, here and here. Pingback: 120 days, 4 months in jail and new developments | Into Jordan | Events in Jordan, Jordanian Blogs and more! Its no surprise that the Dictator Saleh of Yemen has cut off internet services. Freedom of information and knowledge are a dictators worse enemy. But yet two american administrations have helped to keep this creep in power. We try and keep track of some of this on our blog Broadcasters of Tomorrow. As journalism students we admire everyone’s attempts to express themselves in intelligent and thoughful ways. Internet filters and blocks won’t do much to stop people from expressing themselves. The strong and resourceful voices manage to be heard.